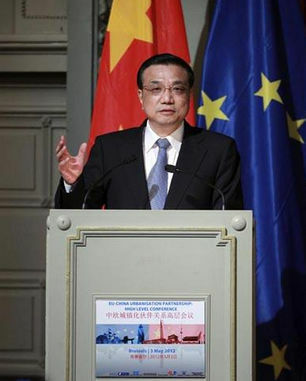 It gives me great pleasure to attend the High-Level Conference on China-EU Urbanization Partnership. The EU leads the world in industrialization and urbanization, and China is the largest developing country with rapid progress in urbanization. On my current trip to the EU, I have come all the way from Budapest, the Pearl of the Danube, to Brussels, the Capital of Europe. I have been greatly impressed by the rich historical heritage and diverse and modern appeal of European cities. This high-level conference, a concrete step taken to implement the agreement reached at the 14th China-EU Summit and advance the China-EU Partnership on Urbanization, marks the beginning of a new endeavor to promote China-EU strategic cooperation on urbanization. Cities are the crystallization of human civilization, and urbanization is an important part of modernization. Today, the global urban population is about 3.6 billion, and 70%-80% of the people of developed countries live in cities. Meanwhile, emerging economies and developing countries, with millions of people joining the urban population every month, have become the main force driving urbanization in the world. In the age of economic globalization, cities around the world have brought countries closer than ever before. Urbanization is changing our world and our way of life in significant ways. The Industrial Revolution which began in Europe in the 17th century started the process of industrialization and urbanization of the human society. European cities with unique features are focused on saving urban space, providing good public services, creating a livable environment, preserving natural landscape and historical traditions, and developing coordinated urban systems. In recent years, Europe has endeavored to blaze a new trail in building smart, green and low-carbon modern cities. China, a country with an ancient civilization, also has a proud history of urban development. The famous painting Riverside Scene During Qingming Festival vividly captures the life of Kaifeng, a dynamic commercial city in China in the 12th century. Chinese cities are also unique in their own ways. Since the launching of reform and opening-up program over 30 years ago, China has quickened the pace of industrialization and urbanization, with urban population increasing from 170 million to some 700 million. The emergence of a number of city clusters with strong influence and dynamism for development has boosted economic development and social progress.